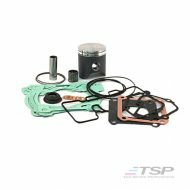 This TSP top end rebuild kit will suit KTM300EXC/XC and Husky 300TE/TX models from 2017-2018. 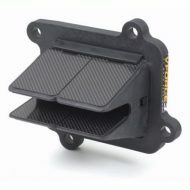 Images shows the parts you will receive. Piston kit in the size of your choice (A or B). 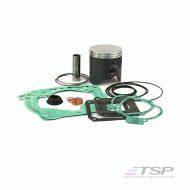 Piston kit includes rings, pin, circlips and a high quality cast piston with anti-friction coating. These pistons are made in Italy and are THE BEST available. 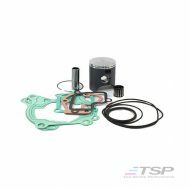 Top end gasket kit. 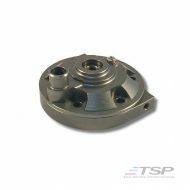 Made in Italy and packed especially for TSP. 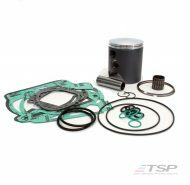 Includes a selection of base gaskets, powervalve cover gaskets, copper washers and O rings… all O rings are the correct size and made from the correct material, unlike the cheaper aftermarket kits. 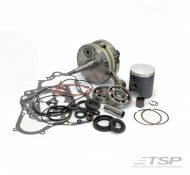 TSP rebuild kits are put together by TSP using parts sourced direct from OEM manufacturers in Japan and Europe. 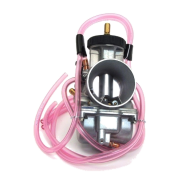 The parts we select are THE BEST available for each make/model and many are the exact same parts as the genuine items. All TSP rebuild kits are kept in stock at TSP. Piston sizing: ideally you should measure your bore with a dial gauge to work out the correct piston sizing. If you cannot do this then a rough rule of thumb is use an A size under 100 hours of engine run time and use a B size over 100 hours of engine run time. Its ALWAYS better to have a bit too much clearance than not enough, so if in doubt use an A size.